For other uses, see Asura (disambiguation). The guarding figure asura giant dvarapala holding mace flanked by two apsaras. 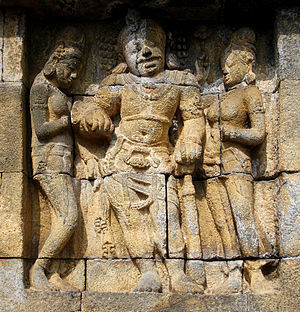 The bas-relief of lower outer wall of Borobudur separating Kamadhatu and Rupadhatu realm. 8th century Central Java, Indonesia. An asura (Sanskrit/Pali: असुर, असुरो) in Buddhism is a demigod or titan of the Kāmadhātu. They are described as having three heads with three faces each and either four or six arms. The Buddhist asuras are derived from the asuras of Hinduism, but have acquired a few distinctive myths which are only found in Buddhist texts. In its Buddhist context, the word is sometimes translated "titan, "demigod", or "antigod". While all the gods of the Kāmadhātu are subject to passions to some degree, the asuras above all are addicted to them, especially wrath, pride, envy, insincerity, falseness, boasting, and bellicosity. Because of their passions, rebirth as an asura is considered to be one of the four unhappy births (together with rebirth as an animal, a preta, or a being in Naraka). The state of an asura reflects the mental state of a human being obsessed with ego, force and violence, always looking for an excuse to get into a fight, angry with everyone and unable to maintain calm or solve problems peacefully. Beings may go to the asura realm because though in human form they have good intentions, they commit bad actions such as harming others. The asuras are said to experience a much more pleasurable life than humans, but they are plagued by envy for the devas, whom they can see just as animals perceive humans. The asuras of some inferior realms however, are malevolent (such as the corruptor Mara) and can be referred to as demons. They are alternatively called rakshasas. In terms of power, asuras rank above humans but below most of the other deities. They live in the area at the foot of Mount Sumeru, at least partially in the sea that surrounds it. On the popular cosmic picture of the Bhavacakra, the asuras are sometimes shown as a sixth stage of existence, and sometimes grouped together with the devas. The five-stage version was the original, and the addition of the asuras as the sixth was done in Tibet on the authority of Je Tsongkhapa. The leaders of the asuras are called asurendra (Pāli: Asurinda) "Asura-lord". There are several of these, as the Asuras are broken into different tribes or factions. Among them are the bow-wielding Dānaveghasa Asuras, and the terrible-faced Kālakañjakas. The principal leaders are Vemacitrin (Pāli: Vepacitti), Rāhu (also called Veroca or Verocana), and Pahārāda. Asura in Kōfuku-ji, Nara, 734, Japanese. The Asuras formerly lived in the Trāyastriṃśa world on the peak of Sumeru with the other gods of that world. When Śakra became the ruler of that world, the asuras celebrated by drinking a lot of Gandapāna wine, a liquor so strong that Śakra forbade the other gods to drink it. Weakened by their drunkenness, the asuras could not resist when Śakra had the whole lot of them thrown over the edge of Trāyastriṃśa into what would become the Asura-world at the base of Sumeru. A tree grows there called Cittapātali; when the asuras saw it blossom, they saw that it was different from the Pāricchattaka (Sanskrit: Pāriyātra) tree which had grown in their old home, and they knew that they were dispossessed. They now meditated on war. In armor and weapons, they climbed up the steep slopes of Sumeru "like ants." Śakra set out to meet them, but was forced to retreat because of their numbers. Passing through the forest where the garuḍas live on his flying chariot, Śakra saw that his passage was destroying the nests of the garuḍas and ordered his charioteer Mātali to turn back. When the pursuing asuras saw Śakra turn about, they felt certain that he must be coming back with an even larger army, and they fled, ceding all the ground they had gained. Despite their many wars, there was eventually a partial concord between the Trāyastriṃśa gods and the asuras. This came about because Śakra fell in love with Sujā, daughter of the Asura chief Vemacitrin. Vemacitrin had given Sujā the right to choose her own husband at an assembly of the Asuras, and she chose Śakra, who had attended disguised as an aged Asura. Vemacitrin thus became Śakra's father-in-law. ^ Sampa Biswas (2010). Indian Influence on the Art of Japan. p. 72. ISBN 8172112696.